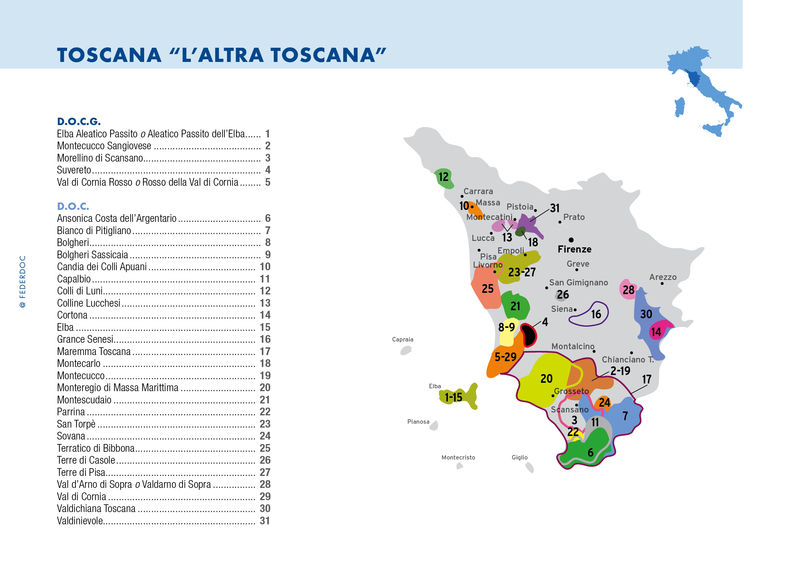 Tuscany is Italy’s 6th largest wine producer, and its output includes 62% DOC/DOCG. Red wine accounts for 85% of the region’s production. 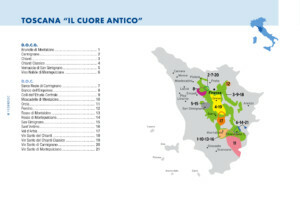 Florence’s region remains the nation’s most dynamic producer of premium wines. 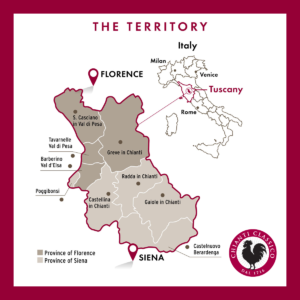 Tuscany’s modern renaissance in wine began in Chianti, in the central hills around Siena and Florence, but it rapidly spread to take in the strip along the Mediterranean coast that was not previously noted for vineyards. Tuscans continue to excel with classical reds based on the native Sangiovese vine––Chianti, Brunello di Montalcino, Vino Nobile di Montepulciano, Carmignano and Morellino di Scansano––all DOCG. 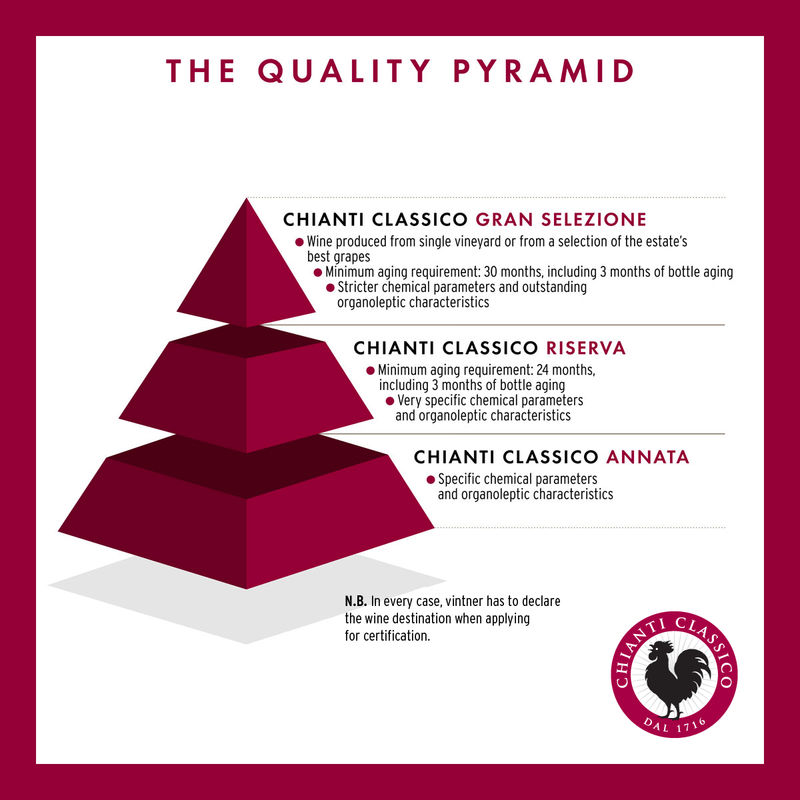 Chianti, still the dominant force in Tuscan viniculture, is produced in seven distinct zones and adjacent areas that cover a vast territory of central Tuscany around the original core of Chianti Classico, which has a DOCG of its own. Tuscany’s appellation of greatest fame is Brunello di Montalcino, a DOCG from a fortress town south of Siena. It is made from a specific clone of Sangiovese known as Sangiovese Grosso and, by law, can only be sold after five years of ageing (of which a part occurs in wood barrels). Meanwhile, Vino Nobile from the town of Montepulciano is gaining newfound appreciation for its elegant, floral wines made from the Sangiovese clone known as Prugnolo Gentile. The production of upscale alternative wines, which began as a trend, became an essential factor in the general improvement of Tuscan reds. Cult wines known as “Super Tuscans” are particularly coveted from the coastal Bolgheri DOC and usually feature international varietals, as the warmer maritime climate is less suited to Sangiovese. Though not generally known for its whites, Tuscany produces a few standouts including Vernaccia di San Gimignano, from the ancient Vernaccia vine, which became the region’s first white DOCG. The Vermentino grape has also spread across the coastal hills as a white variety of real promise.  Tuscan winemakers also pride themselves on Vin Santo, a rich, sweet, oxidative-style wine, made from partly dried grapes and aged seven years in small wooden barrels.